Blog 2018 SHAPE America College Bowl! 2018 SHAPE America College Bowl! Attention Future Professionals attending the Nashville Convention! 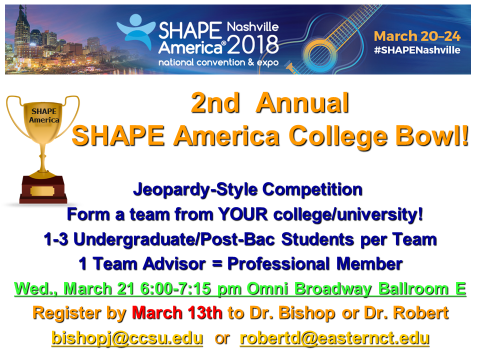 Participate in the SHAPE America College Bowl! Find more information here . If you’re interested in participating as a team you must RSVP by March 13. Send Your RSVP Today!